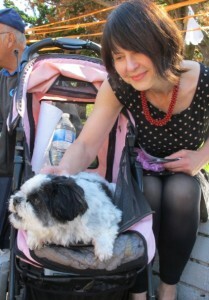 Editor’s Note: We first met Charlie at Dog-O-Ween 2013, along with his constant companion, Elizabeth Guare. Charlie and Elizabeth are also regular customers at the Downtown Farmer’s Market, where FoPAAS has a small booth on the street facing the market. While Elizabeth shops, she leaves Charlie near our table, and we enjoy keeping him company. Here is Elizabeth’s story with a happy ending. Charlie Button was discovered in the overnight box at Oakland Animal Services, matted, paraplegic, and miserable. Nevertheless, the shelter determined that he might be treatable, given time…. Charlie went through a few foster homes, but he was uncertain of what was happening to him. Charlie and I adopted each other three years ago, and he has found his forever home! With the help of physical therapy, he’s taught himself how to walk again. 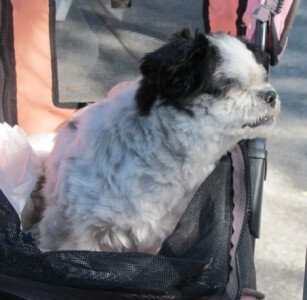 If he gets tired, we use his pet stroller, which has everything he needs. We were lucky to find each other!